What happens when you stick a hyphen into culture? Rian Hughes’s Cult-ure asks the question ‘What is a book?’ writes Sallyanne Theodosiou. 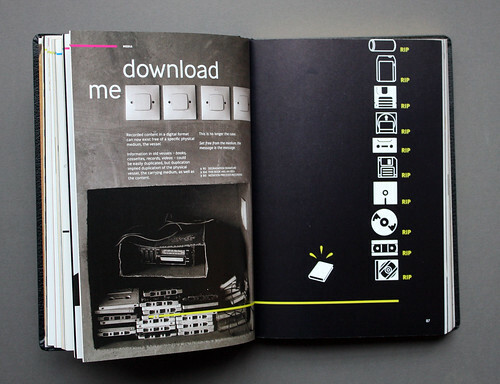 Each spread of the 364-page volume can be read as a self-contained item, but also has footnote directions (like physical ‘hyperlinks’) to other spreads, so page 104, ‘This book has an idea’, links to ‘Download me’ on p.86 (above), and ‘Burn this book’ on p.310. These help illuminate Hughes’s ideas and encourage the reader to dip in and out or move backwards and forwards at will. 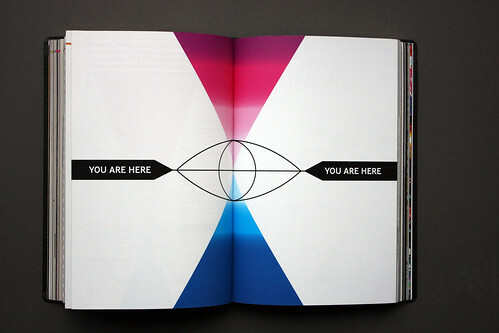 Each spread is succinct enough to get the information across while also encouraging further research and questioning. 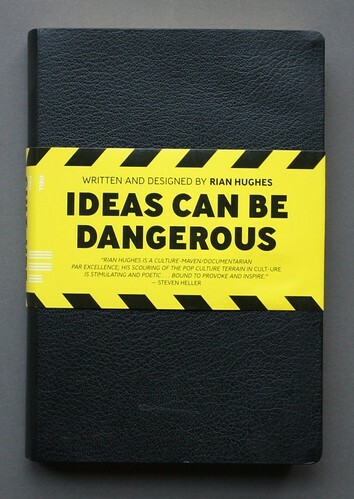 The book is highly visual and engaging, with gags and interactive aspects of the cut-outs included adding a different dimension and instigating deeper consideration of Hughes’s ideas. 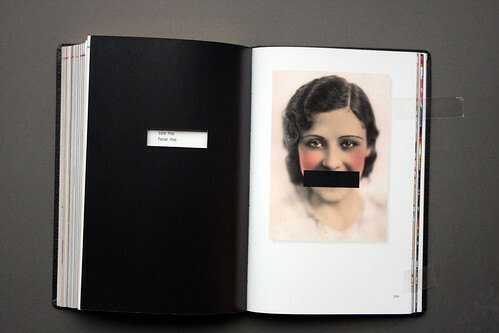 The strongest visual sequence shows the eyes of a woman appearing as if looking through a niqab (top), yet I turn the page and she is gagged against the opposite page’s ‘see me hear me’, reading through the cut-out (pp.296-299, above). Cult-ure also considers the question of ‘authority’: how one approaches ‘authoritative’ texts and the ideas they contain. The Bible is referenced by the soft cover and gilt-edged pages. The ‘warning’ belly band (above) adds another element. 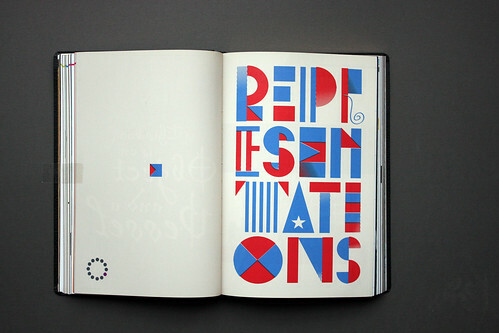 Hughes’s unusual visual methods emphasise the essential attitude of an open mind that one should bring to any text / idea / thought. Good design educators constantly question students on their research and contextual studies reading. Which ‘voices’ have they been ‘listening’ to in order to inform their own idea generation? The need to develop sound intellectual analysis, to identify good from bad, is more important than ever: this book encourages its readers to question. Cult-ure will appeal to a wide range of individuals, both professionals and students. It promotes a vast range of ideas and thoughts, encouraging us to question and reflect on previously held orthodoxies that we have consumed as a result of our culture. 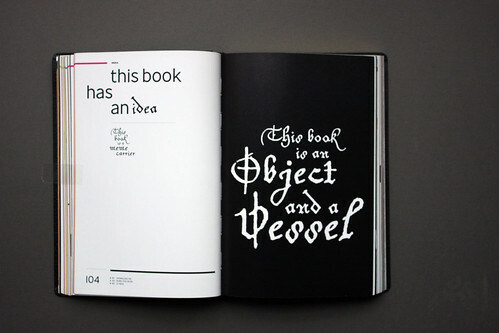 Sallyanne Theodosiou is Senior Lecturer in Graphic Design at the University for the Creative Arts, Epsom. 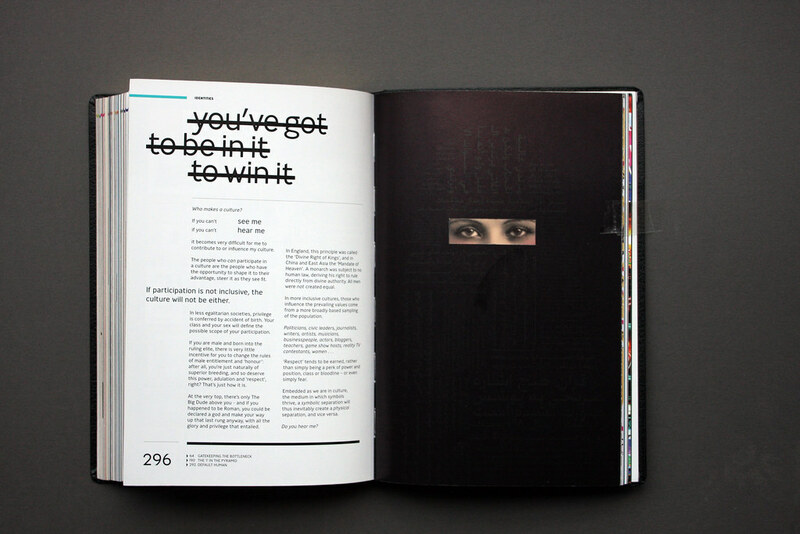 Eye is the world’s most beautiful and collectable graphic design journal, published quarterly for professional designers, students and anyone interested in critical, informed writing about graphic design and visual culture. It’s available from all good design bookshops and online at the Eye shop, where you can buy subscriptions, back issues and single copies of the latest issue, Eye 81.